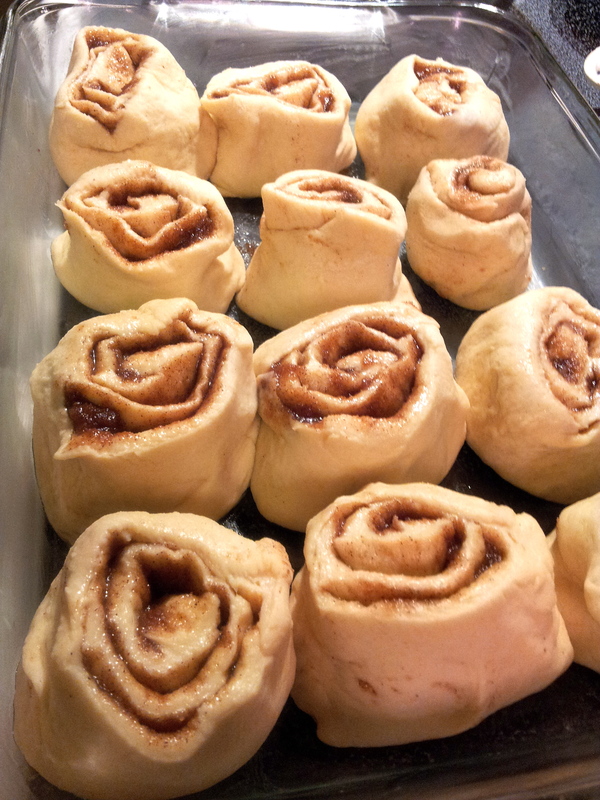 These cinnamon buns were too good and too fun to make for me not to share with you all. You can forget about counting the calories because you will go for more than one. In the last three years, for Christmas morning, we either had pancakes or french toast along with cheesy eggs, crispy bacon, and fresh fruit. Between cooking and unwrapping presents, I find myself running back and forth from the kitchen to the living room giggling like a kid. By the time things get settled the food is cold. So I asked myself , “What about cinnamon buns?!. 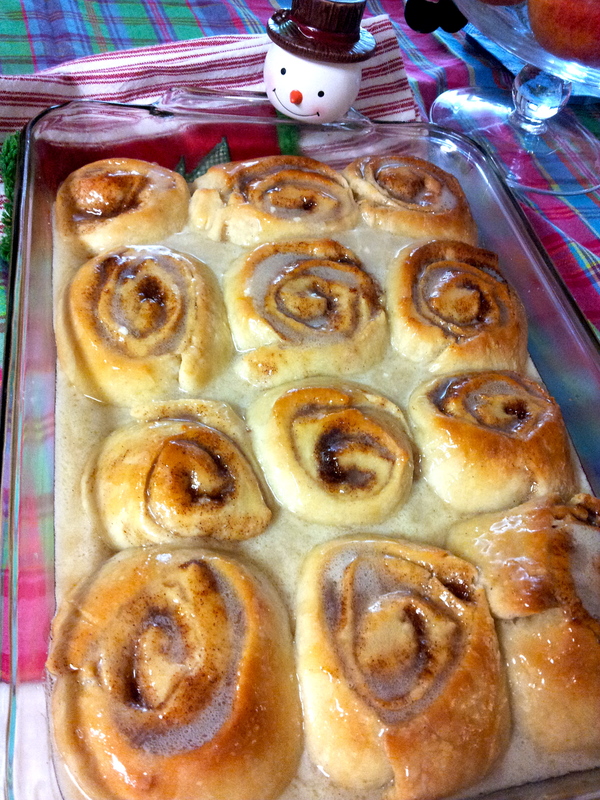 They could stay warm longer with the frosting I bathe them with just before serving!”. The only thing about this recipe is that I juggled between three recipes and grabbed the general idea of it. The frosting recipe I found was from The Pioneer Woman’s cookbook, and, well, I was tempted to eat it by itself. In small mixing bowl, dissolve the yeast in hot water and add 1 tablespoon sugar. Let it sit. Meanwhile, combine in another small mixing bowl the melted butter and warm milk. Using an electric mixer with the dough hook, mix dissolved yeast and butter/milk mixture on low. Slowly add 1/2 cup sugar and egg. Add salt and 2 cups of flour on low. Blend until smooth. Slowly add 1/2 cup of flour at a time until you have incorporated the other 2 1/2 cups. Dough should become a ball in the mixer. Place dough on a floured surface and knead dough until it doesn’t stick to your hands. Do not over knead or add too much flour. Place in a greased bowl and cover with a damp cloth and allow the dough to rise for about 45 minutes to 1 hour. The dough should double in size. As you wait for the dough to rise, you can make the sugar mix and frosting. In a medium mixing bowl, mix all until well combined. In a mixing bowl, mix powdered sugar and melted butter until well combined. Add milk, coffee, maple syrup and salt. Stir until frosting is smooth and creamy. After dough is ready, place it on a lightly floured surface. Flatten the dough out to a long rectangular shape. 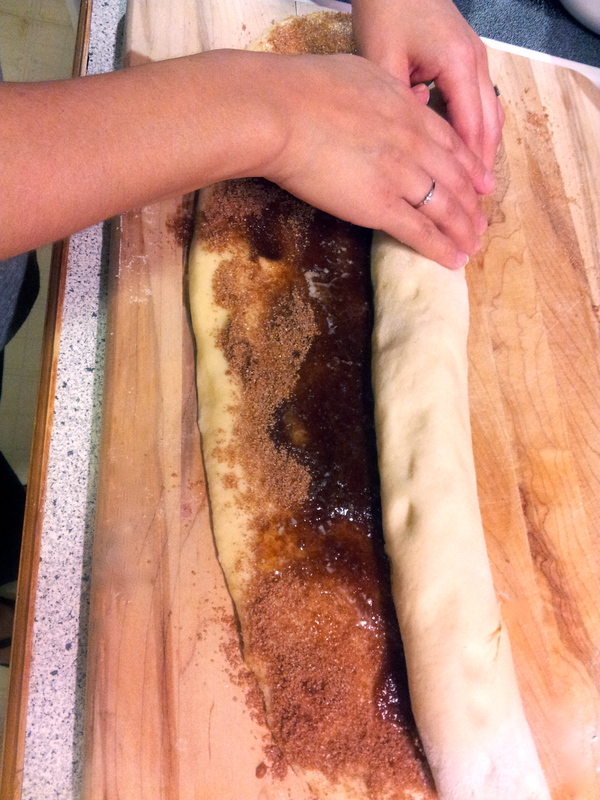 With your hands spread melted butter (1/2 cup) on the dough. Sprinkle the filling evenly. Carefully roll the dough to a log. As Julia Child would say, “you are the boss of that dough”. With a serrated knife cut out 12 buns and place them on a greased pan. Look at these! The aroma was luring the family to the table. Grab your share because they will go fast. I hope you had a nice Christmas and that you look forward to the new year. “You are the boss of that dough!” lol!! !